Maurice El Medioni - "Cafe Oran"
Although born into a famous musicians' family from Oran, Maurice El Medioni had to teach himself how to play the piano. From the age of nine this instrument attracted his special interest; In Maurice El Médionis teenage years few years later he boogie-woogied the whole neighborhood playing at cafés during lunchtime. Later he founded one of the first ever rai groups, mixing Caribbean and Arabic styles into his own and unique piano sound. 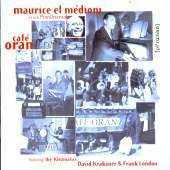 In this record Maurice El Médioni, the master PianOrientalist - now in his sixties - gathered around him some good old friends to evoke the sound and atmosphere of Café Oran. It features intricate melodic lines with strong oriental flavour, swinging percussion grooves and heartful singing. Special appearances by Frank London & David Krakauer (The Klezmatics)!